Portrait courtesy of Madison County Historical Society. 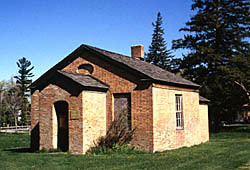 Gerrit Smith (1797-1874), a nationally prominent and influential abolitionist and social reformer who played a critical role in the operations of the Underground Railroad, lived on this estate and conducted business out of this land office. 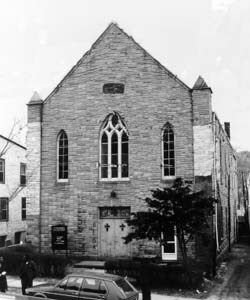 A major turning point in Smith's life occurred when he attended the Utica Conference of 1835, where 600 antislavery advocates assembled at the Bleeker Street Presbyterian Church. A mob of 80 rioters, including Congressman Samuel Beardsley, stormed the church, forcing the group to flee the building. Smith offered to host the meeting the following day in his home town of Peterboro, a small community named after Gerrit Smith's wealthy father, Peter. The events surrounding the Utica Conference moved Smith to serve as president of the New York Anti-Slavery Society between 1836 and 1839. By the end of his term, Smith was calling for abolitionists to defy the law and help fugitive slaves escape into freedom. During the 1840s and 1850s, Smith acted as a "station master" in the Underground Railroad. His Peterboro estate provided a widely recognized safe haven for runaway slaves enroute to Canada and was recognized as a financial and intellectual center of the antislavery movement. The Smith family had extensive land holdings in New York, and the Land Office, constructed by Peter Smith in 1804, was the administrative focal point of the family's real estate activity and business ventures. Out of the Land Office, Gerrit Smith sold farm tracts for one dollar each to 3000 poor African Americans, many of whom he had helped escape into freedom, with approximately 140,000 acres being transferred betwen 1846 and 1850. Now owned by the Town of Smithfield, the building provides a tangible link to the life of one of the Underground Railroad's most active participants. The estate has been designated a National Historic Landmark. The Gerrit Smith Estate and Land Office are located in Peterboro, New York at the corner of Nelson and Main Streets. The Land Office and the Lodge, now the location of Smithfield Mercantile, are open to the public. The barn and laundry are currently undergoing repairs. Visit the website for more information.